The Chancellor's Committee on Sustainability and Energy (CCSE) focuses on the hard work of realizing the UIC Climate Commitments via the Climate Action Implementation Plan (CAIP) in the areas of energy and utilities, sustainable materials and waste management, biking and transportation, transformative grounds, teaching and learning, and climate resilience. The UIC Climate Commitments offer a shared vision for the campus in meeting the challenges of climate change. 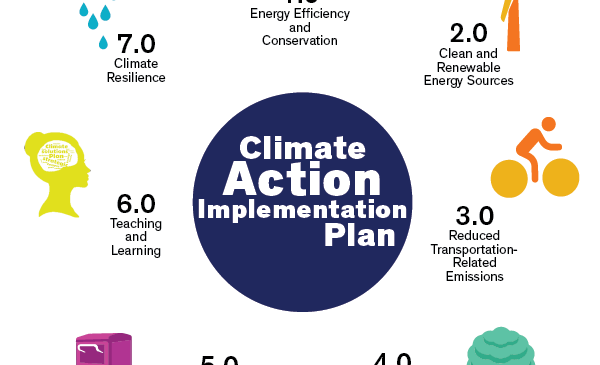 The CAIP is UIC's roadmap how to implement the goals of the Climate Commitments. The CCSE is made up of six subcommittees that meet regularly. Meetings are open to all members of the UIC community including faculty, staff, and students. Education & Research works on the implementation of Strategy 6.0 of the CAIP: Teaching & Learning. The CCSE Energy & Utilities subcommittee focuses on initiatives including energy efficiency and conservation projects, renewable energy, and greenhouse gas emissions reduction from electricity and co-generation activities. This also includes water conservation and green building policies. Energy & Utilities works on the implementation of Strategy 1.0: Energy Efficiency and Conservation, Strategy 2.0: Clean and Renewable Energy Sources , and portions of Strategy 4.0: Natural Systems and Ecosystem Services of the CAIP. 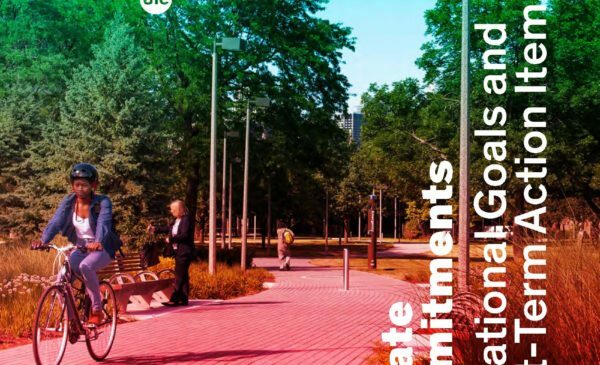 The CCSE Grounds subcommittee makes recommendations on policies that guide the management and maintenance of UIC’s landscape and non-building facilities, including the care of trees on campus, native plants and pollinators, as well as management of stormwater. Grounds works on the implementation of the majority Strategy 4.0 of the CAIP: Natural Systems and Ecosystem Services. The CCSE Sustainable Materials (formerly “Recycling & Waste Management”) subcommittee looks at UIC’s recycling and waste management programs including general recycling, composting, construction, special and hazardous waste, and recommends processes and programs to reduce waste volume and increase recycling rates as well as developing policies to increase sustainable materials into UIC’s purchasing policies. Sustainable Materials works on the implementation of Strategy 5.0 of the CAIP: Sustainable Materials and Reduced Waste Streams. The CCSE Transportation subcommittee examines transportation on and to campus, including air travel for university business, develops transportation policies, and monitor progress towards reducing greenhouse gas emissions from the campus fleet and through commuting patterns. Transportation works on the implementation of Strategy 3.0 of the CAIP: Reduced Transportation-Related Emissions.